I know almonds are supposed to be one of the best things people can snack on, but there’s just something so obnoxiously wholesome about them. In their natural state they taste like joyless tree bark. And the people who can eat bags of raw, skin-on almonds as their afternoon snack without immediately reaching for a bag of ruffles afterward exhibit a level of discipline that I find frightening. On the other hand, I love the flavor of salty, roasted almonds on ice cream or with butter on my green beans. It took me an embarrassing amount of time to figure out that the worst thing about almonds as a snack is the skin (stupid, tooth-sticking nut-bark) and the raw-ness. And that both of these issues are easily fixable. 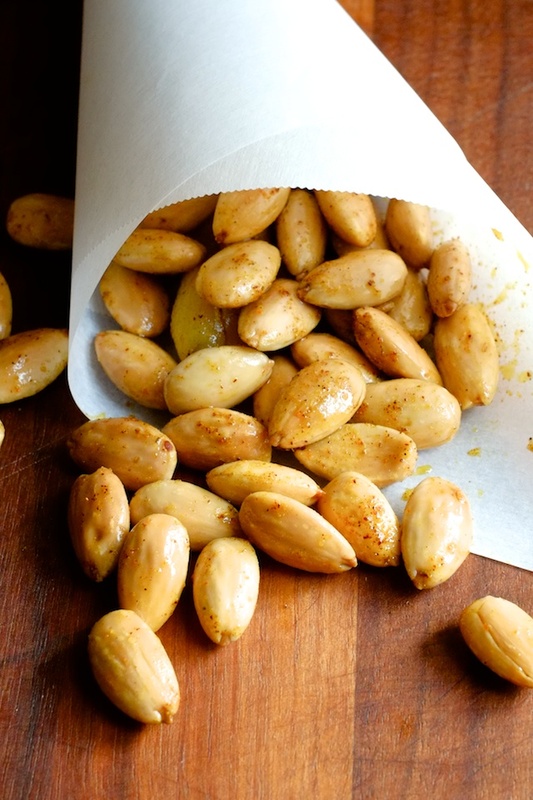 The secret to crave-able, snack-worthy almonds is blanching. 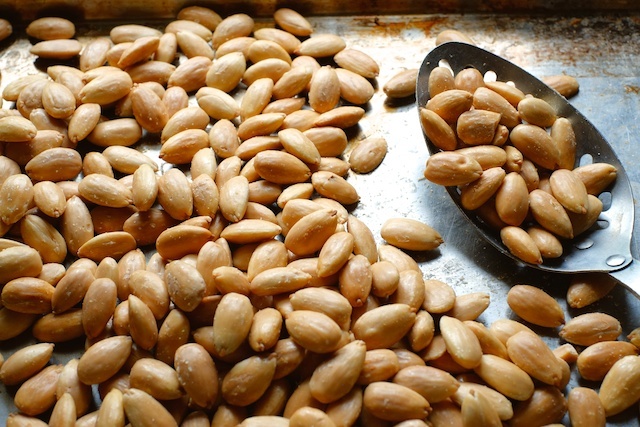 Dunk raw almonds in boiling water for about 30 seconds, pull them out and shock them with some cold water, then salt them and roast them yourself. 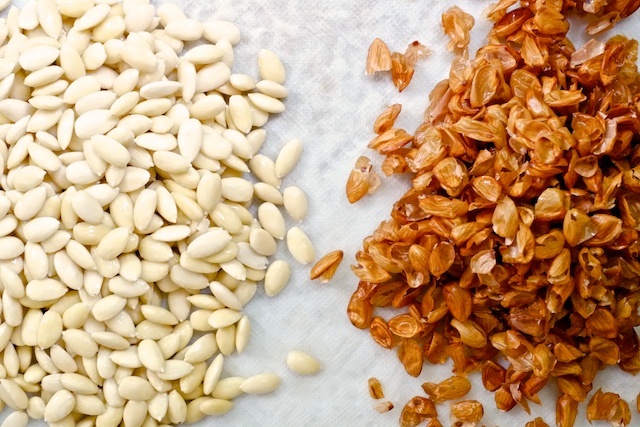 The result isn’t just better than raw almonds, it’s completely transformed. I would even go as far as to deem these almonds worthy of appearing next to a wedge of parmesan on your next cheese tray. Plus, with blanching and roasting, you haven’t even really altered the caloric content of the almonds, so yay. Popping the almonds out of their skins is about a 15 minute time commitment for a full pound of almonds, but it’s worth it if you ask me. If anyone comes up with a more efficient skin-removal method than popping the almonds out one-by-one, I’m all ears. 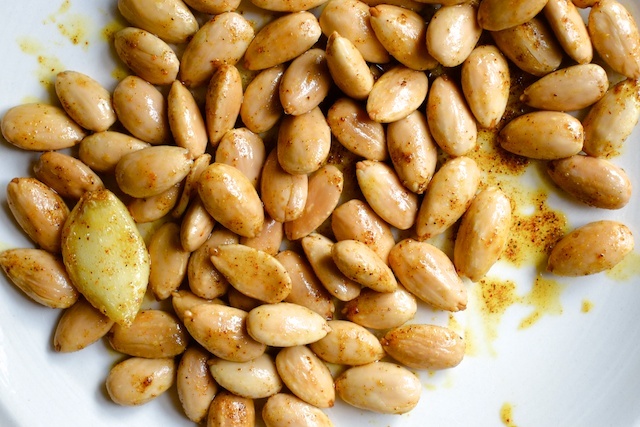 I prefer eating these almonds plain, but they’re also really easy to jazz up. For this variation I just heated some oil in a pan, added some crushed garlic, a dash of curry powder, a pinch of cayenne, and tossed in the almonds for an extra layer of flavor. They don’t need it, but they do like it. 1. Set a medium-sized pot of water over high heat and bring it to a boil. Prepare a bowl of cold water with ice and set it aside. Preheat your oven to 400 degrees Fahrenheit. 2. Blanch your almonds in the boiling water about a cup at a time. 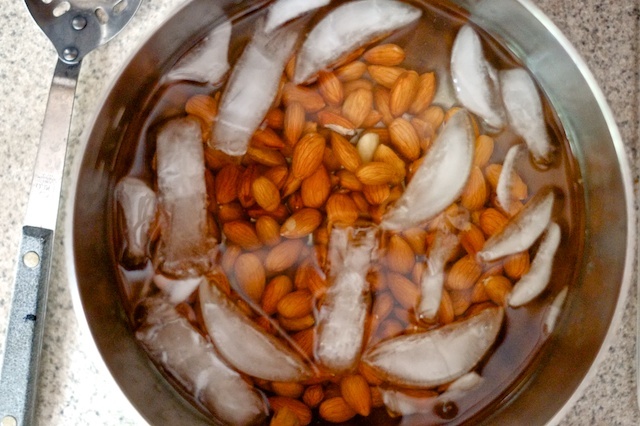 The almonds may cause the water to bubble up, so add them slowly. After thirty seconds or so, use a slotted spoon to transfer them to the bowl of ice water. 3. 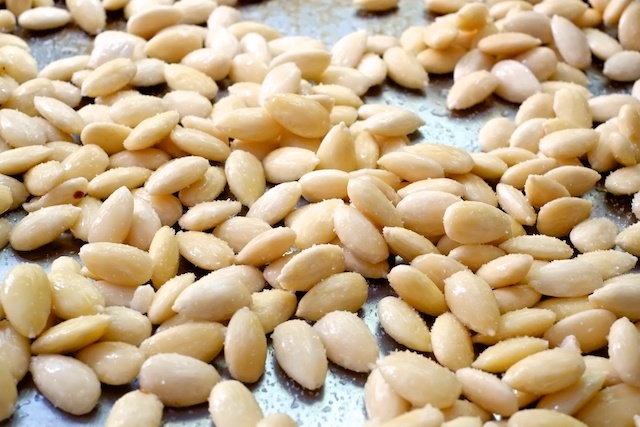 After blanching the almonds, you will notice that the skins have wrinkled up and loosened around the almonds. 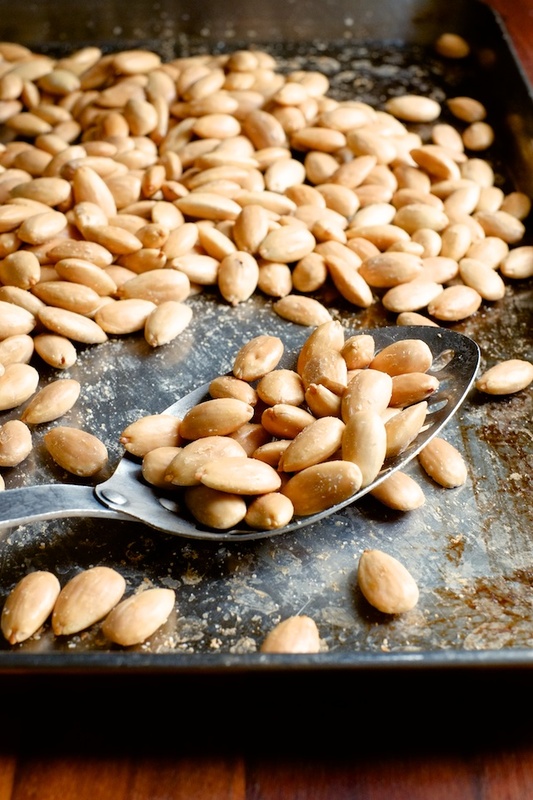 One by one, pinch the almonds until they pop out of their skins and transfer them to a baking sheet. 4. 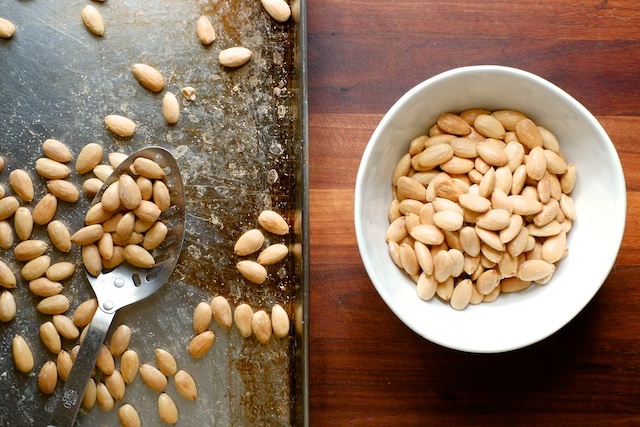 While the almonds are still wet, sprinkle them liberally with salt and give them a stir. Roast them in your pre-heated oven for between 15-20 minutes, or until they are as brown as you like them. Allow them to cool and snack away. 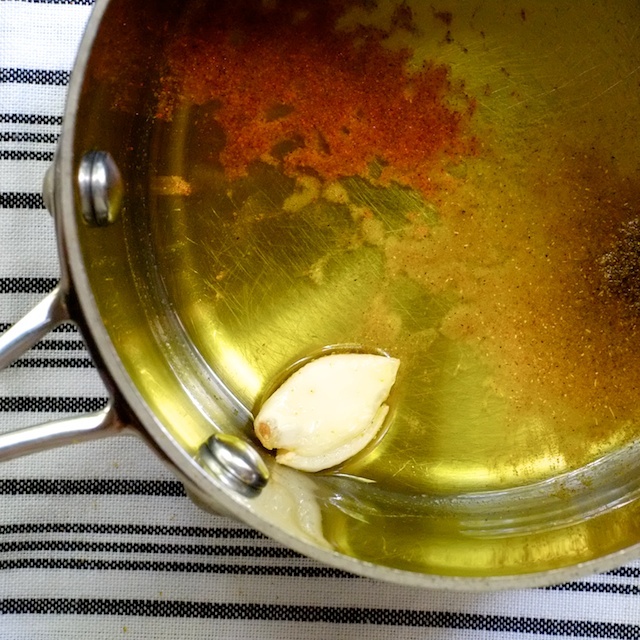 * If you want to add extra flavor, heat a Tablespoon or two of olive oil or butter in a pan over medium heat and throw in a clove of garlic to infuse the oil. Once the garlic is fragrant, add a teaspoon or two of your favorite spices (I used curry and cayenne, but you could use paprika, black pepper, cumin, etc). It’s really hard to screw these up, so play around and find what you like best.